The Bundesliga bursts back to life with a blistering Friday night fixture that sees resurgent defending champions Bayern Munich visit buoyant Bayer Leverkusen, and the pre-match stats promise pyrotechnics at the BayArena. “Bayern Munich will certainly find it unpleasant to play here." Boom. The first firework set off by B04 coach Heiko Herrlich demonstrates the confidence pulsing through the veins of Friday’s hosts, who are enjoying a run of 12 games without loss, currently the Bundesliga’s longest unbeaten sequence. “Under the floodlights and against fired-up opponents, this’ll be a good game,” Bayern’s Franck Ribery responded, the flying Frenchman displaying fine form with a 12-minute hat-trick against friendly opponents Sonnenhof Großaspach this week. An incredible 424 goals were scored in the opening half [or the Hinrunde] of 2017/18. The corresponding game between Bayern and Leverkusen accounted for four of those with the Bavarians – recently crowned winter champions for a seventh straight season – running out 3-1 winners on opening night at the Allianz Arena. That result formed part of a tricky opening to the campaign for Die Werkself, who won just one of their first five matches. But how Herrlich’s heroes have responded since then, winning six of their subsequent 12 top-flight encounters to rise to fourth. The goals have flowed for B04 too, so much so that they are just three goals shy of all-powerful Bayern’s tally of 37. However, Leon Bailey, Julian Brandt, Kevin Volland et al will have to be at their attacking finest if they are to put a dent in the best defensive unit in town. Bayern have shipped just 11 goals, that’s seven fewer than the next best back-line in the land, owned by Eintracht Frankfurt. Heynkes’s team also hold an eleven-point edge at the summit and are 13 ahead of Leverkusen. “Obviously it’s nice to have a bit of a lead, but we need to go back on the attack straight away,” Ribery urged. “We’ve won nothing yet and want to be on the front foot in the second half [of the season],” he added. As if boasting the division’s leading goalscorer wasn’t enough, Bayern have added forward powerhouse Sandro Wagner to their striking options to accompany the 15-goal chart-topper Robert Lewandowski. With the Pole netting just three times in 13 meetings with Bayer, the hosts will hope to counter with Volland, the highest scoring German in the Bundesliga right now with nine goals, and five in his last eight. The wings will be alive with the sound of Kingsley Coman and Bailey, the former recently explaining how a change in diet has helped him amass four goals and seven assists across all competitions. Jamaican wunderkind Bailey, meanwhile, has six goals and four assists in his 14 Bundesliga games of 2017/18. 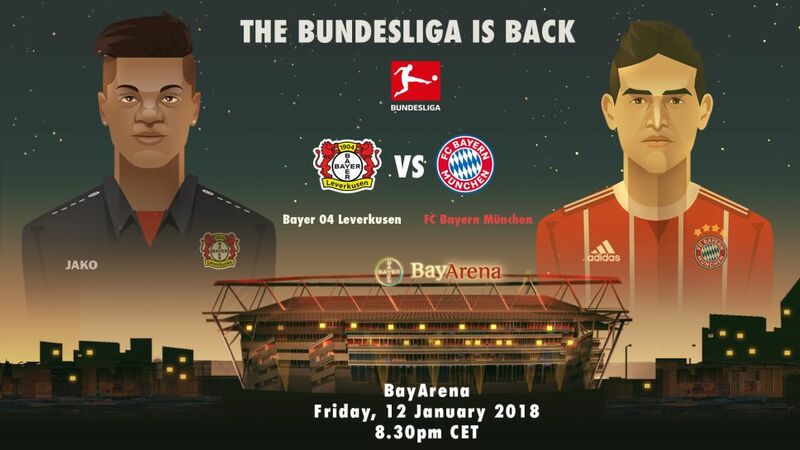 Indeed, with Leverkusen winning at least a point in nine of their previous 17 Bundesliga meetings with Bayern, the hosts know they have more than a fighting chance of upsetting their opponents who are led by a familiar face along the banks of the River Rhine. Heynckes lifted Leverkusen to second and fourth place finishes during a coaching stint here between 2009 and 2011. Currently overseeing a six-game winning run in all competitions, the 72-year-old tactician has suffered just one reverse at the Bayern helm in the 16 matches since his return, winning 14 of those. The numbers all point to a spectacular start to Rückrunde action this weekend, and you can follow all of the fireworks right here with us Bundesliga.com, via the app and across our social channels! Click here for the Leverkusen vs. Bayern Match Centre!